Fuser only - exchange. PrinterTechs compatible, for Laserjet 3000 series. Fuser only - no exchange. PrinterTechs compatible, for Laserjet 3000 series. Fuser only - exchange. New HP fuser, for Laserjet 3000 series. Fuser only - no exchange. New HP fuser, for Laserjet 3000 series. Maintenance Kit - exchange. PrinterTechs compatible fuser, for Laserjet 3000 series. Maintenance Kit - no exchange. 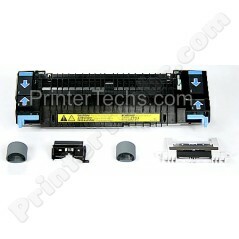 PrinterTechs compatible fuser, for Laserjet 3000 series. Maintenance Kit - exchange. New HP fuser, for Laserjet 3000 series. Maintenance Kit - no exchange. New HP fuser, for Laserjet 3000 series. One of the most common fuser related errors on these printers is the 50.9 fuser error. Yes, unfortunately that means you need to replace the fuser. Other fuser errors you can see are 50.1, 50.2, 50.3, 50.4, 50.7, 50.8. If powering off the printer and turning it back on doesn't make the fuser error go away then you need to replace the fuser. Remember, most print defects are toner related and it really helps to purchase a good toner cartridge - we sell those too! There are a lot of poor quality toner cartridges being sold but we have a much higher standard, give ours a try. Instructions HP Laserjet 3000, 3600, 3800 instructions for replacing the fuser and maintenance kit -- the fuser is very easy to replace and if you get the maintennace kit the rollers and separation pad are also straight forward.